As a child development specialist and a mum, I find myself forever fascinated with the many different ways that babies learn about the world around them. Our wee babies are forever busy using their senses of sight, touch, smell, taste and hearing to learn all they need to know about this brand new world they have entered. Put simply, early baby play is a ll about the senses. The following tips will help you to engage with your baby in these early months. Sight is the least developed sense at birth, so before you start with any play activity you should be aware of how your baby is positioned in relation to the light in the room. To support your baby’s visual development, ensure that the light is shining onto the object that your baby is looking at (e.g. : mum’s face or toy), and not into your baby’s face. Looking directly into the light makes it difficult to focus your vision. To encourage visual development, hold your baby facing towards you approximately 20-30cms from your face. Once your baby has fixed your gaze, slowly move your face from one side to the other (horizontally). This will help to develop your baby’s ability to track objects with his eyes. Don’t go too fast, and wait for your baby to catch up if he loses you. Once he has mastered this you can try tracking up and down (vertically). Encourage your baby to look for sounds. Talking to him while you move across the room will help with this. You can also encourage this with the use of rattles or other musical toys. Your baby’s favourite thing to listen to is your voice, which is no surprise since he’s been listening to it since he was a 20 week old foetus! Singing, reading books and talking to your baby are great ways to help develop his hearing and early language skills. Encouraging your baby to bat at suspended objects will help with the development of his hand control and ability to reach out. Baby gyms with suspended toys are a good way to encourage this skill. 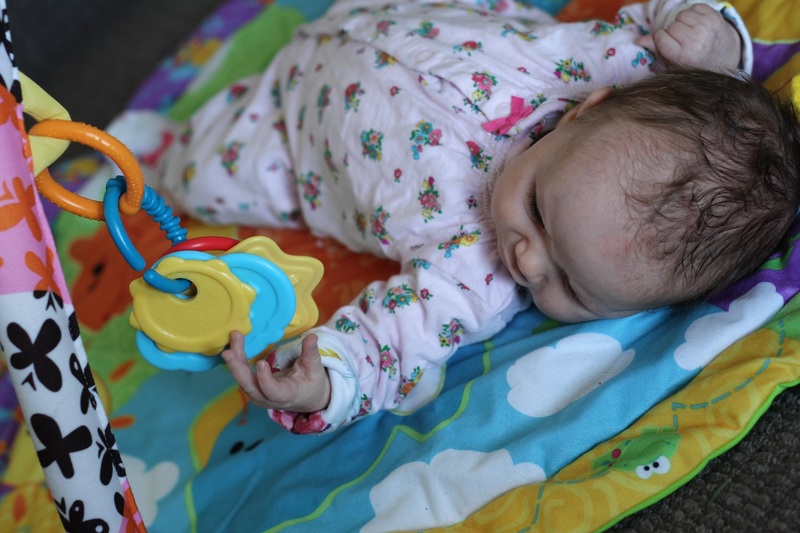 In the early days you will need to position the suspended toy so that it is just near your baby’s hand (you can do this using extra toy links). Your baby’s first attempts at batting a toy will likely be unintentional, but once he gets the idea he’ll be reaching out to get that toy himself. Massage is a great way to help develop your baby’s general awareness of their body and their sense of touch. It’s also a fantastic tool for bonding. It’s not essential to learn any special strokes to massage your baby, the most important thing is for your baby to feel his parents loving touch. Yawn! Playtime is done for now. Parents often want to know how long they should spend playing with their babies, and the golden rule here is to check in with your baby and listen to what they are telling you. Babies are very skilled at telling you when they are ready to play and when they have had enough. A baby who is relaxed, making eye contact or smiling is telling you that he’s ready to play, but the baby who is squirming, looking away and yawning is telling you that they’ve had enough and playtime is over for the moment. 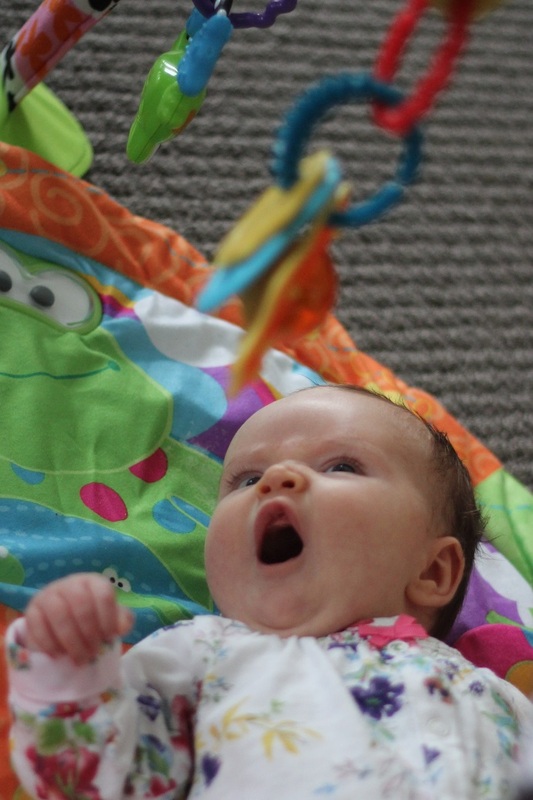 Baby play will not only encourage your baby’s development, but it will also help you and your baby to get know each other in these early months. Enjoy this very special time. How do you enjoy spending time with your wee baby? We’d love to hear how you share these special moments together.